New Green Lake Ultra Modern Home with separate 2 bedroom guest house. The main house enjoys lake, mountian and city views and the guest house sports a great city view. Welcome home to Green Lakes latest modern home, pairing thoughtful design with a comfortable, yet unique open floor plan, ideal for today's active lifestyle. The open concept kitchen will be at "Center Stage" of the home with gorgeous cabinets, a sea of stone counters, a Wolf range, Sub Zero Refrigerator, a wine fridge and an island overlooking the great room. The convenient sliding doors lead you to one of the two view decks. Perfect for entertaining or sun bathing. You will enjoy the spacious Great Room with French Oak hardwood floors, a elegant gas fireplace accent wall, and the dining area with room for a large table and a side table. The 2nd floor offers 3 bedrooms including the large, sunny master suite with en-suite bath sporting double sinks, and a huge glass enclosed spa like shower. The other two bedrooms share large bath with seperate water closet and bath area, as well as double sinks and quartz counters. Don't miss the large laundry room on this level with a deep sink and beautiful cabinetry. Up the outside stairs from this floor is the roof deck with a 360 degree view of Green Lake, Downtown Seattle, the Cascade Mountains, Mount Rainier, the Space Needle and the surrounding neighborhood..
Donpt miss the beautiful 872 square foot separate Detached Accessory Dwelling Unit (DADU) that sports 2 bedrooms, 1.5 baths, hardwoods and air conditioning. Perfect for extended families or would make a great rental for added income. Additional upgrades include: gas fired in-floor radiant heat, wired for high speed internet, wired for sound with speakers in the ceiling, epoxy painted garage floor, upgraded closet organziers in most closets and pantry, steel and glass railings and more. Sophisticated minimalism with exceptional detail shows brightly throughout both the interior and the exterior. Stylish yet approachable. 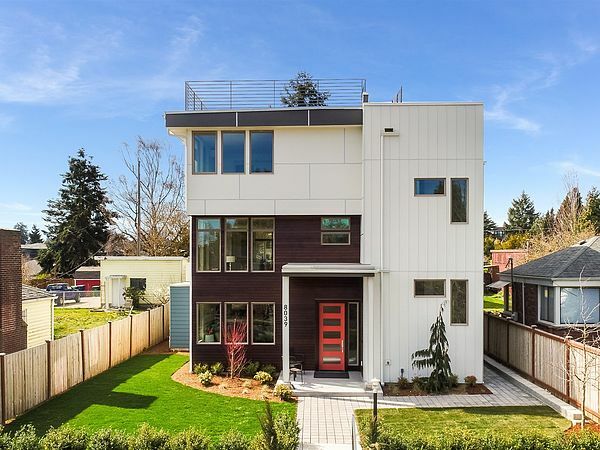 If you are looking for a change in address or a change in lifestyle, look no further than 8039 Interlkae Avenue North in the Green Lake neighborhood. Just 3-4 blocks from the lake. Call Michael Peters today at #206-856-5500 for your confidential and private showing.